The ‘colossus penguin' was 6.5 feet tall and weighed 253 pounds. He could stay underwater for 40 minutes hunting fish. He was likely very loud and terrifying. 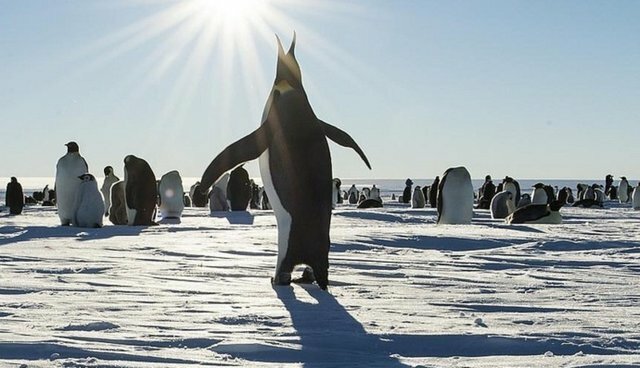 He lived 37 to 40 million years ago on the Antarctic coast, along with 9 to 13 other species, according to researcher Carolina Acosta Hospitaleche of La Plata Museum in Argentina. She told New Scientist that this was "a wonderful time for penguins." Acosta Hospitaleche reported the most complete Palaeeudyptes klekowskii (it's only colloquially called the "colossus penguin") skeleton ever found this year -- a compilation of about a dozen wing and feet bones. Now, she's given the world more evidence of the ancient giant -- part of a wind and a tarsometatarsus, a bone formed by the fusion of ankle and foot bones. She used these puzzle pieces to estimate the penguin's length from beak tip to feet for her latest study -- a mind-boggling 2.01 meters (6.6 feet). For some comparison, the average emperor penguin weighs in at about 100 pounds -- a measly shrimp, compared to this ancient colossus.